How did I become too Jewish for my Jewish mother? Before my non-Jewish husband and I became engaged, we took a class on interfaith relationships at the Center for Religious Inquiry in New York. By showing we were serious about working through interfaith issues, we hoped to allay my family’s doubts about our marriage. The class, taught by a rector and a rabbi, helped us work through our concerns about being able to make an interfaith marriage work. We learned about the importance of making decisions early surrounding child-rearing and we agreed our children would be Jewish. We communicated our decision to my family and hoped that it would ease the tension our relationship had created. My family’s only experience with an interfaith marriage was my maternal uncle’s. My uncle’s home had no religion with the exception of a tree and gifts on Christmas. In fact, my cousin found out he was “half” Jewish by accident. When he was 10 years old, he made a comment about Jews during Thanksgiving. My mother said, “We’re Jewish, your grandfather is Jewish and your dad is Jewish.” My cousin said, “I’m not,” and left the room. Understanding that my family’s experience with intermarriage was not positive, we worked to show that an interfaith home could have a religious identity. After we got married, we hosted a Hanukkah party for my family in Connecticut. When work transferred us to Cincinnati, we found a temple that welcomed interfaith families. It provided both a religious home and a way to meet people. When our son was born, we had a bris and became regulars at Tot Shabbat. We moved to Dallas and again made it a priority to join a synagogue. We were fortunate to find another temple that welcomed interfaith families. We became active in outreach programming. I got involved in the Interfaith Moms group and my husband started the Interfaith Dads group. We developed friendships with families like ours and have learned how to build a strong Jewish identity in our child. We started with the premise that Jewish identity is not shaped just in December; it’s a yearlong process. With that in mind, we began to celebrate Shabbat in our home. Our Shabbat gradually grew from blessing the candles, wine and hallah, to include tzedakah, blessing each other and our son, discussing the week’s Torah reading if appropriate for our 4-year-old and ending with grace after meals. It is one of our favorite parts of the week. Our Jewish homebuilding journey has been a wonderful experience. I have had the opportunity to explore and embrace my Jewishness in ways I had not done or felt comfortable doing in the past. And I love watching my husband and son discover the joys of the Jewish holidays and traditions. I thought the first time my mom visited after we started our Shabbat ritual, she would be excited to celebrate with us. Instead she said we should go out for dinner. Why was I making things difficult for myself? She was in Dallas to make my life easier by relieving me of the hardships of cooking. I politely explained that I appreciated her offer, but enjoyed making Shabbat and that we liked celebrating together at home. My mother has repeated this refrain every time she has visited for the past two years. Each time, I explain that Shabbat is not a burden, but a joy. When we began making decorations for our sukkah, my mother again asked why I was going to the trouble. I told her it was fun for our son and gave us the opportunity to be thankful for everything we’d grown in our own garden. My mother’s response to the Jewish home we’ve made is one of the most challenging things we’ve come up against in our interfaith experience. We expected a more positive response because we are doing exactly what we promised to do: create a Jewish home and raise our son Jewish. Instead, there is a sense that we’ve gone too far. I shared my confusion with our rabbi. He said, she does want your family to be Jewish, but she wants you to be Jewish they way she is Jewish. The problem is my home is different than her home and her childhood home, where both parents were Jewish. While my parents were active in our synagogue, religious celebrations were limited to High Holiday meals, Passover seders and the lighting of Hanukkah candles. Passover and Hanukkah were the two occasions when we said blessings over candles or food at home. Religion was practiced in temple. G-d was not discussed at home and Torah stories were not used to drive home good lessons. This approach to building Jewish identity can pass in a home where both parents are Jewish, but an interfaith home needs to be more thoughtful. Interfaith couples need to spend more time practicing Jewish rituals, and engaging in a dialogue about what it means to be Jewish and what you want to impart to your children. My mother continues to ask if we can go out to dinner on Friday night. But, she has started to make Shabbat dinner at her home in New Jersey when we visit. I did not ask her to do this and have expressed our appreciation. While she isn’t the type to take a class or attend a discussion to learn about interfaith issues, I do hope that over time, my mother will learn to appreciate our rituals. Who knows, she may embrace some new ones herself. 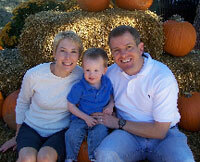 Jane Larkin lives in Dallas with her husband and son and is a member of Temple Emanu-El. She is chair of the temple's outreach committee and a former leader of the Interfaith Moms group. She writes a parenting blog for InterfaithFamily.